Raw pumpkin just didn’t sound appetizing to me or to hubby. He wrinkled up his nose when I told him I’d be making raw pumpkin pie. I figured if it was gross, I could always cook it. 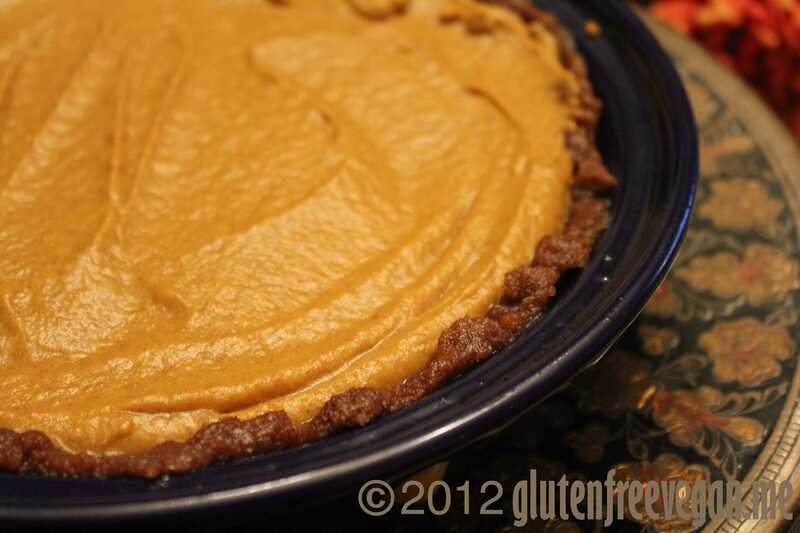 But, to both of our surprise, this raw pumpkin pie recipe is delicious. Not sure I’ll ever cook a pumpkin pie again. Yeah, it’s that good. Place all ingredients into powerful blender and mix until all ingredients are blended into a very smooth and creamy filling. Pour into raw pie crust and chill in refrigerator for at least 2 hours. Serve chilled. Makes one full size pie. This entry was posted in desserts, Recipes and tagged dessert, gluten-free, glutenfreevegan.me, glutenfreeveganme.com, healthy, pumpkin pie, raw, raw vegan, raw vegan gluten-free pumpkin pie, recipe, thanksgiving, vegan, vegan cooking, vegan recipes. Bookmark the permalink. Thanks Paula! I love them too and was really surprised how tasty the raw pumpkin was in this recipe. No time to bake? Try Sweet Magic cookies!